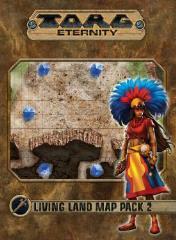 Living Land Map Set 2 is a high-quality, double sided map of The Living Land and will bring any TORG Eternity game into focus. This gridded map is an important addition to any game set in The Living Land. On one side is the Lost World, featuring an eerie disruption within a jungle cliff face. Strange monoliths create a boundary that could be a mere warning or mark a force field or more devious defenses. Twisting caves run through the cliff side for more danger and exploration. On the reverse side is the Overgrown City Street. This decaying urban landscape is a hallmark of the Living Land. Buildings crumble and cars rust in the streets, while vines and trees grow unstopped everywhere. Cross the rooftops, or defend a barricade formed from rubble. Highly useful for any foray into The Living Land!